America grants the individual the freedom to stand, kneel or avoid action during an anthem. In a country where freedom is praised and defended, peaceful protest should be allowed. 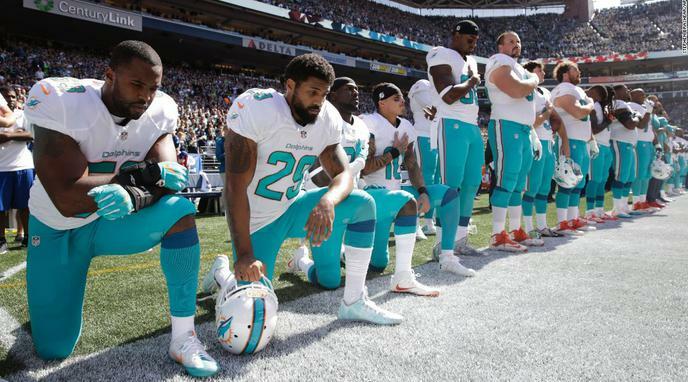 The players should avoid the National Anthem entirely. One's personal belief, no matter its sacredness, should in no way be forced on another. Kneeling is a form of free speech. There are many religions in the US that preclude their members from engaging in the pledge or anthem, which is why they cannot be forced in schools. Not supporting the ability of any American to also abstain based on conscience puts religious liberty at risk. It is normal, common, and legal for employers to discipline and/or terminate their employees for causing problems with their public relations. Nothing about the national anthem or America's freedoms make this situation any different. America doesn't prohibit private contracts between consenting individuals that would require parties to that contract to stand for an anthem. Active duty members of the military are required to stand and face the flag, with salute if in uniform, when proximate to the raising of morning colors (anthem), and evening colors (taps). Freedom of speech also protects the NFL's right to regulate players' conduct while representing the NFL. Opponents can argue that their rules are immoral or selective, but it would be difficult to challenge their legality.